It’s almost impossible to replicate the complex flavours of Chef Susur Lee’s Singaporean Style Slaw, but my version is pretty tasty! This recipe is my take on the slaw, using more traditional Lo Hei ingredients (the dish that the slaw is based on). I’ve been wanting to recreate Chef Susur Lee’s signature dish, the Singaporean Style Slaw, since I first tried it in his restaurant. This was a few years ago, when I went to Lee restaurant with my mom and Mandy for Summerlicious. The three of us fell in love with the dish, with all of its varying textures and flavours (thanks to more than 19 ingredients!). So this year we thought it would be a fun dish to make to celebrate the Lunar New Year, or Chinese New Year as most people know it by. Especially since the dish is actually based on a dish called Lo Hei, which is traditionally served especially for this occasion. I had the opportunity to interview Chef Lee for an article that I wrote for Yahoo Canada, and we talked at length about why the Singaporean Style Slaw is so important to him. He explained to me that he came to Canada from Hong Kong, and now considers himself Canadian. In the same way, he took a traditional Cantonese dish and adapted it to suit Canadian ingredients, while still maintaining core Asian ingredients. 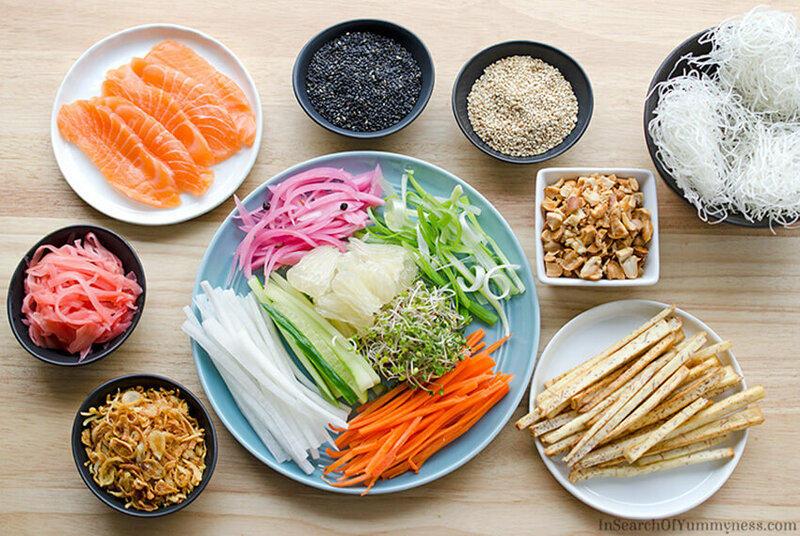 The traditional Lo Hei dish is made with about 14 ingredients, which include shredded vegetables, fruit and something crispy (like crackers or fried shallots). The Singaporean Style Slaw is similar in that it has many ingredients, and incorporates thinly slices veggies and crispy elements, but the restaurant version is dressed up with a variety of micro greens and edible flowers. 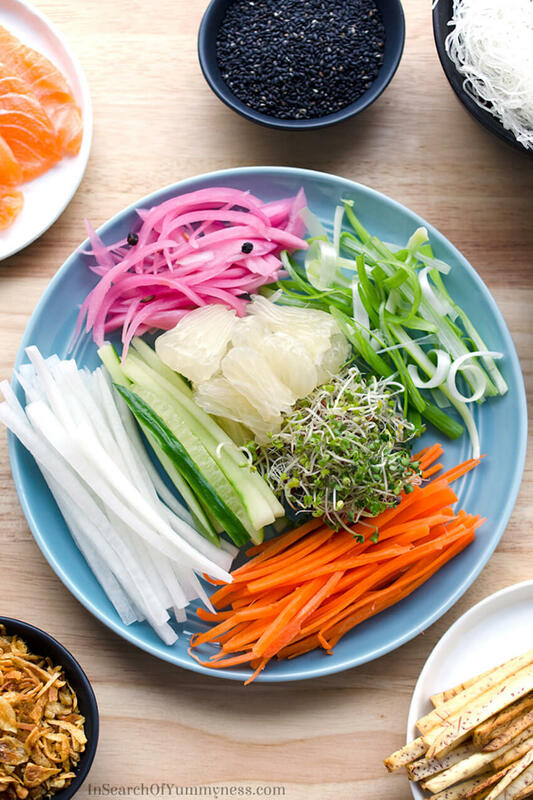 The version that we came up with is adapted from the Singaporean Style Slaw recipe (because that’s the only version we’ve actually eaten), but with some elements from the classic Lo Hei dish. We made sure to include raw fish, because that is one of the most important traditional ingredients. We also included Chinese 5-spice powder and pomelo (an Asian grapefruit). There are actually special phrases that you’re supposed to say as you add each ingredient to the bowl. Now obviously, I have no idea what these phrases are, and although Mandy is Chinese, she isn’t familiar with this custom. If you’re curious about the sayings, there’s a really handy infographic on the Lady Iron Chef website that you can check out. 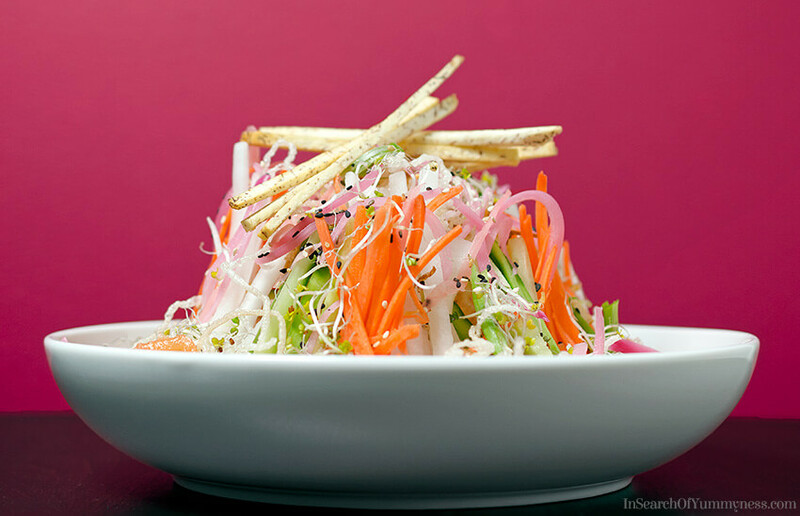 This Singaporean Style Slaw is loaded with fresh raw veggies! Now, I’m not going to lie, slicing up all of the ingredients can take a while. This isn’t a quick salad that you can just throw together on a weeknight. The dish is meant to be eaten on special occasions after all, so it’s not surprising that it takes so much work to put together. There are some shortcuts that you can take to make things go a bit faster though. First of all, get yourself a Julienne peeler. These gadgets have special pointy teeth that help you quickly break down produce into thin strips. 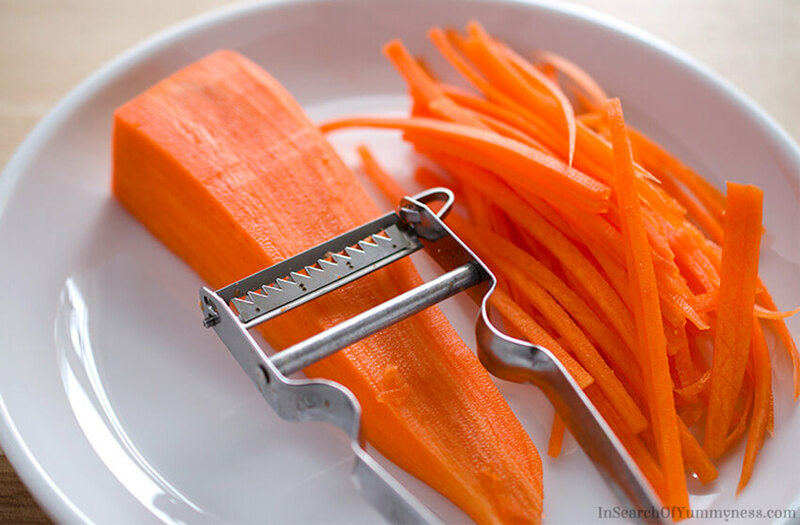 Admittedly, veggies that are hand-cut into julienned strips are a bit more sturdy than what you get with this peeler, but this is so much faster! Next, see if you can buy any of the ingredients pre-made. I opted to use store-bought fried shallots instead of making my own, and I also purchased the salmon sashimi from my local Asian grocery, because there was no way I could butcher that myself! You can also find taro chips at most grocery stores (sometimes in the health food section), which is a good substitute to slicing up fresh taro root and frying it yourself. Some of the ingredients may be a bit harder to find than others. 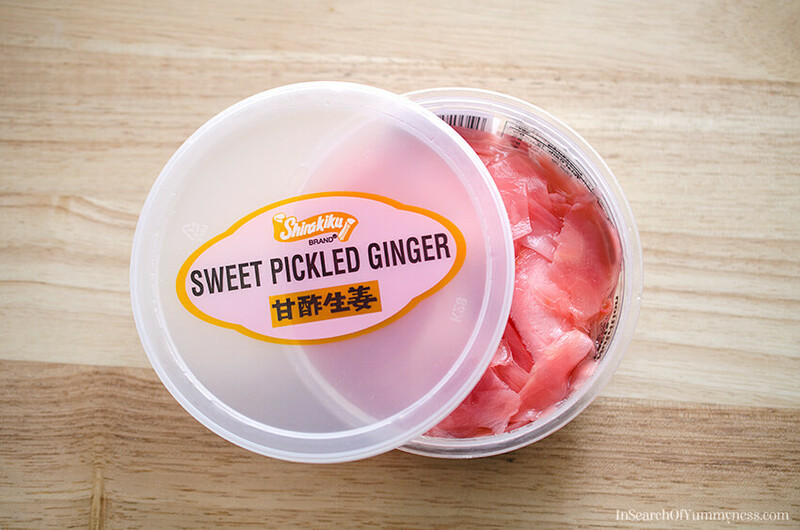 I had to go to an Asian grocery store to find the sweet pickled ginger (shown above), and the umeboshi plums. Whereas my local superstore had both white and black roasted sesame seeds, mirin, rice wine vinegar etc. If you can’t find something, don’t stress about it. Many of the ingredients can be substituted or omitted, and the slaw will still taste great. 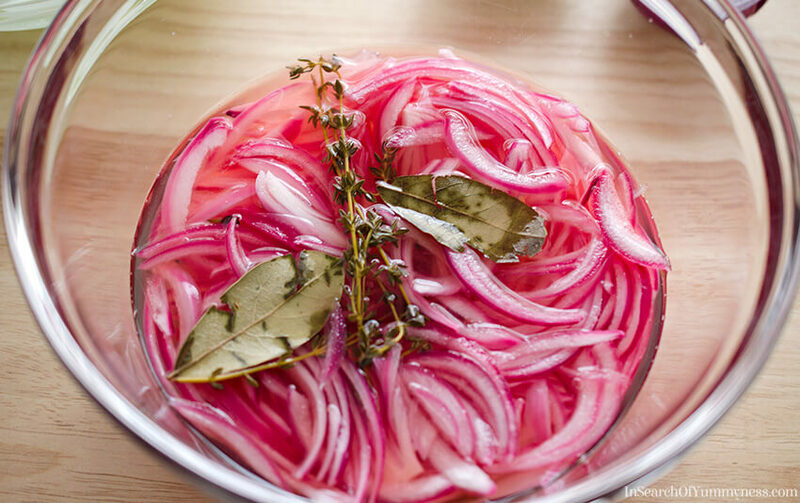 For example, if you don’t want to pickle the red onions, you could just slice red onions and stick them in ice water until you’re ready to put the dish together. You could also swap white grapefruit for the pomelo, or jícama for the daikon radish. 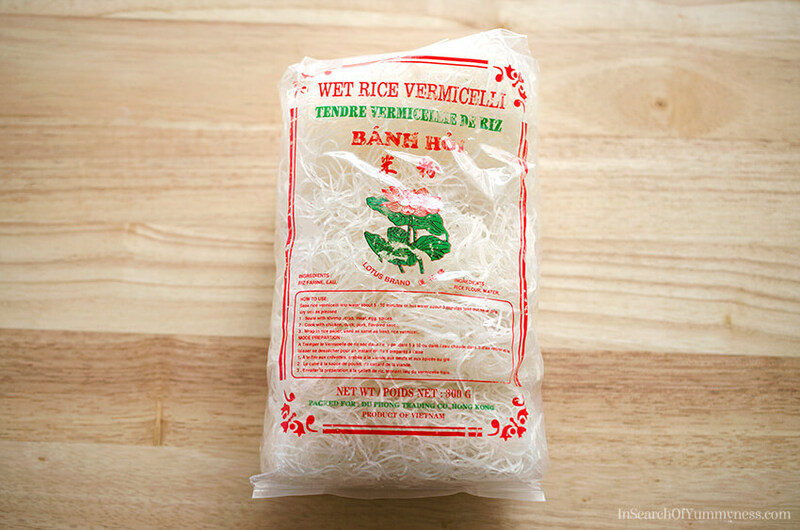 The vermicelli noodles have a similar texture to prawn crackers when fried, so you could try using those instead. Or try frying a different kind of rice noodle. There’s lots of room to play and experiment with this dish. The dressing is the only area that’s a bit tricky, as I’m not really sure what you could use instead of the umeboshi plums. The plums are available as a paste, which you can buy online, so that helps a bit. But the taste of the plums are hard to replicate with any other ingredients. Be warned before you try making this dressing, the plums (whole and in paste form) are extremely salty. They’re sour too, but the saltiness is mind blowing. Use sparingly if you’re salt sensitive! You can also balance out the flavour of the plums by adding more honey, a little bit a time. 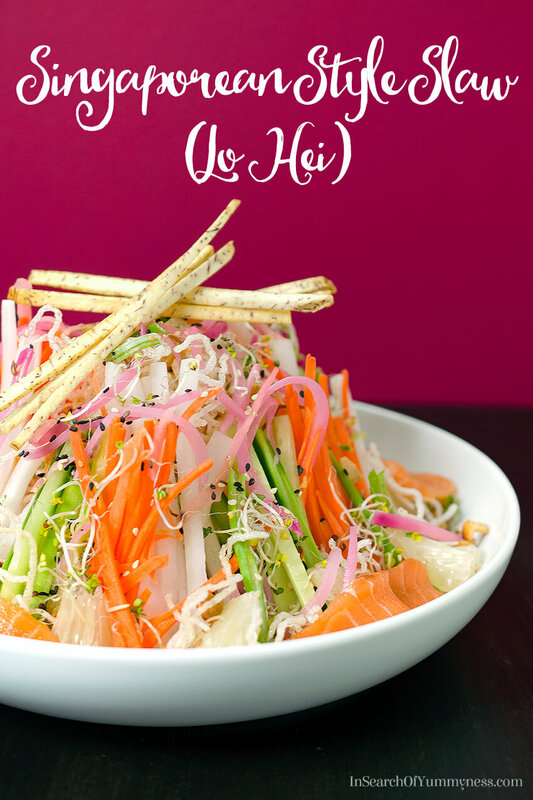 While this Singaporean Style Slaw is vastly different from the traditional Lo Hei dish, and a far cry from Chef Lee’s showstopping masterpiece, it’s still an impressive showpiece that is fun to share with your friends and family. Serve it family style at the table, or set out the prepared ingredients and let everyone build their own. Maybe Singaporean Style Slaw parties will become a thing, who knows? 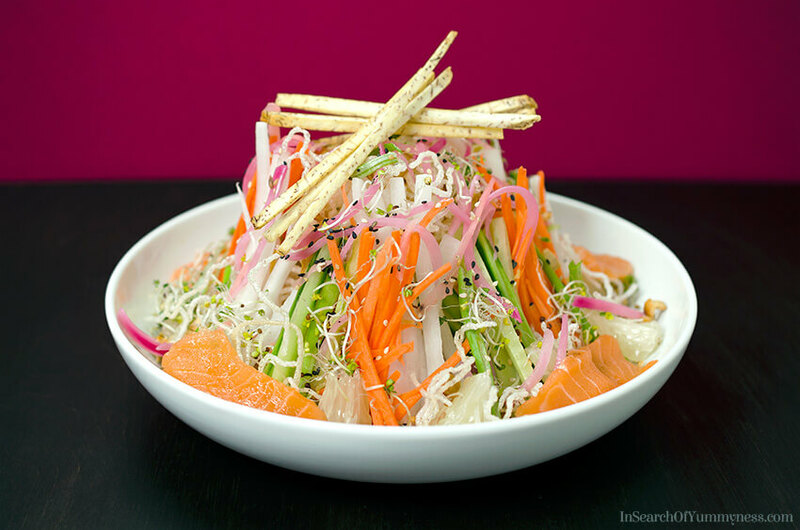 The Singaporean Style Slaw is Chef Susur Lee's adaptation of the traditional Lo Hei dish. This is my take on the slaw, using some of the more traditional Lo Hei ingredients. Place a small saucepan over medium-high heat, add vinegar and water and bring to a boil. Meanwhile, peel and thinly slice red onion. When water is boiling, add salt, peppercorns, fennel seeds, bay leaf, and thyme, then continue boiling for another 5 minutes. Remove pot from heat and add in the sliced onions. Stir to separate the pieces, and leave to soak for at least 1 hour, but preferably 3 hours. 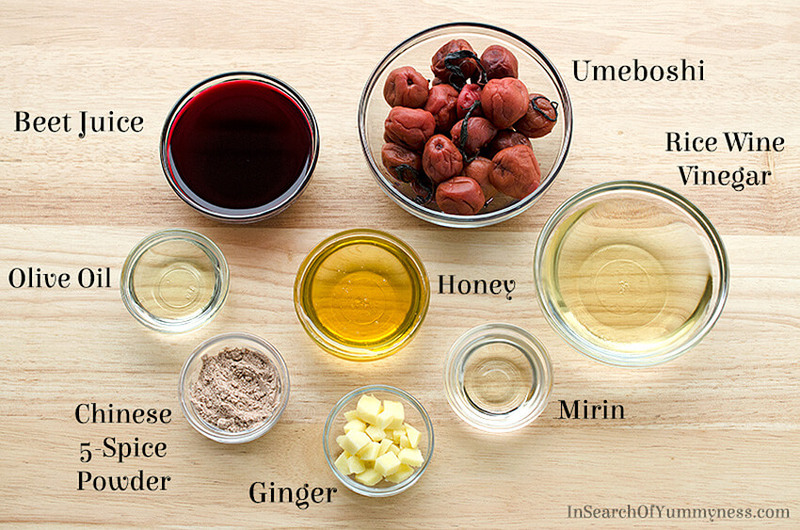 In blender, combine pitted umeboshi plums, vinegar, mirin, oil, honey, ginger, and beet juice. Puree until the mixture is smooth. Taste and adjust seasoning if needed. You may want to add more honey if the dressing is too sour for you. Blend again, then set aside. Place sliced green onion in an ice bath and set aside. Meanwhile, heat large pot of vegetable or canola oil until the temperature reaches 375°F. Carefully deep fry handfuls of taro root at a time, for about 2 minutes or until crisp and lightly golden. Remove taro sticks from oil and place on paper towel to drain. Season lightly with salt. After frying all of the taro, quickly deep fry vermicelli noodles in batches for about 5 seconds, or until they curl or puff up. Remove fried noodles from oil and place on paper towel to drain. Season lightly with salt. Remove green onion from ice bath and drain. Pat dry with paper towel and set aside. Spoon some of the dressing on the bottom of a large serving bowl. Place a large handful of the crunchy noodles on top of the dressing, then arrange the sliced vegetables vertically around the noodles to create a cone shape (like a tipi). 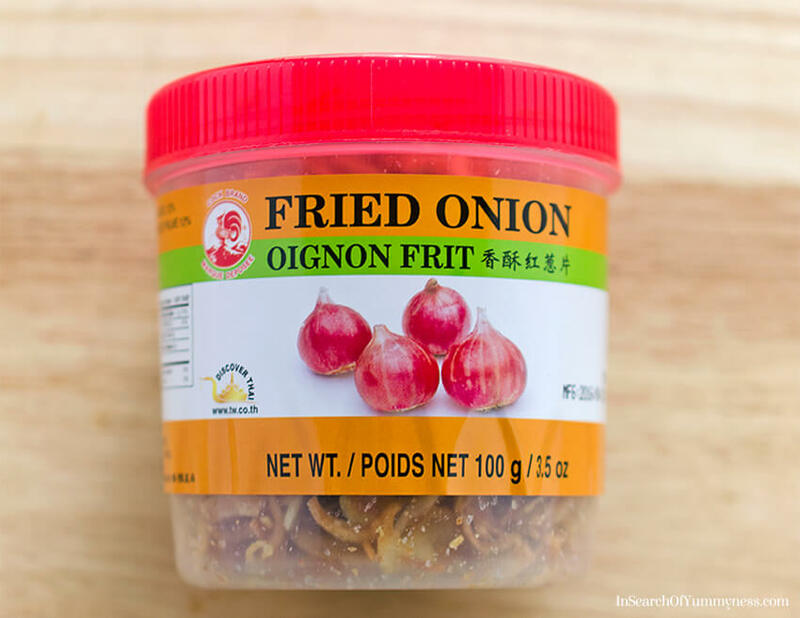 Sprinkle fried shallots over the vegetables, and around the edge of the bowl. Add the pickled ginger and pickled onions, sprinkling them over the vegetables. Add the pomelo segments and sprouts around the edge of the bowl. Sprinkle on both kinds of sesame seeds, and the roasted peanuts. Carefully place the salmon pieces around the edge of the plate, if using. Add the green onions and crispy taro sticks to garnish. Toss before serving, and serve with extra dressing. *If you are salt sensitive, you may not want to add the full cup of umeboshi plums to the dressing. Start with half the amount, and slowly add more to taste. The dressing should be salty and a bit sour, in order to add flavour to the raw vegetables. Adapted from Chef Susur Lee's Singaporean Style Slaw with Salted Apricot recipe. This post contains an Amazon affiliate links. This is gorgeous, Shareba! It also sounds absolutely delicious. Nothing beats a crisp slaw with flavors like that. I also love how versatile these slaws are — great on their own or added so a sandwich or wrap! Thanks Dana! That’s true, you could totally use this in a sandwich or wrap. Great Recipe! I bookmarked your page so I could try it. Thanks for sharing. Thanks for checking out my post Fouzia! This is absolutely gorgeous, and it sounds like a truly fantastic meal. It’s interesting to hear Chef Lee’s story about it, and to see your interpretation of it! I’m tempted to give it a go myself. Cheers! I love everything about this post Shareba! From the bright pink backgrounds, to the salty umeboshi, and even that awesome peeler! I’ve been using one for years…everyone should have one in their gadget drawer. I want a big bowl of this right now! Haha thanks Bernice! The peeler really does come in handy. Any thoughts on what to use the rest of the umeboshi in? I’ve got a whole jar full lol! What a beautiful recipe, Shareba! I absolutely love the flavours in there, and it sounds like a perfect “kitchen therapy” recipe for me. Which means, I love a recipe that takes a little work, and lets me lose myself in the kitchen for a while, all with a glorious result. Bookmarking!